An Introduction to Applied and Environmental Geophysics, 2nd Edition, describes the rapidly developing field of near-surface geophysics. The book covers a range of applications including mineral, hydrocarbon and groundwater exploration, and emphasises the use of geophysics in civil engineering and in environmental investigations. Following on from the international popularity of the first edition, this new, revised, and much expanded edition contains additional case histories, and descriptions of geophysical techniques not previously included in such textbooks. The level of mathematics and physics is deliberately kept to a minimum but is described qualitatively within the text. Relevant mathematical expressions are separated into boxes to supplement the text. The book is profusely illustrated with many figures, photographs and line drawings, many never previously published. Key source literature is provided in an extensive reference section; a list of web addresses for key organisations is also given in an appendix as a valuable additional resource. 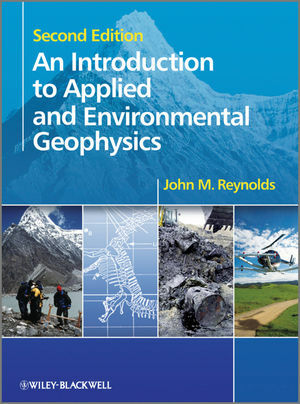 John M. Reynolds is the author of An Introduction to Applied and Environmental Geophysics, 2nd Edition, published by Wiley.